Best close-up binocular we've seen - check out those butterflies! Compact, 4.4 inches long by 4.25 inches wide, weighs 10.5 oz. The word “Papilio” is Latin for “butterfly” and the name tells us that the Pentax Papilio binoculars were designed specifically for looking at butterflies. What makes the Papilio a butterflying binocular? The short answer is: the amazing close focus. 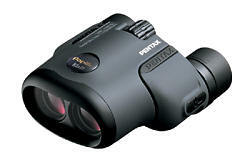 Pentax lists Papilio binoculars as having a minimum close focus of just 19-20 inches (or about 0.5 meters). When we first received the Papilios, we tried it out and in disbelief tried it again! We easily got down to 18 inches with no field collapse and remarkably crisp image quality, a close-focus capability that is unmatched by any other binoculars. If you ever want to get close to something with a binocular, this is the one! 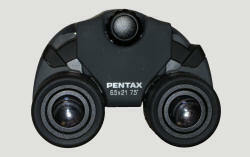 The key concept with Pentax Papilio binoculars is versatility. Papilio binoculars are great for viewing anything from butterflies to birds to sporting events and concerts. With their compact, lightweight design and their ability to double as a binocular/magnifying glass, the Papilios are a fabulous binocular for kids. Papilio binoculars are a reverse porro prism design offered in 6.5x21 and 8.5x21 models. The “reverse” means that unlike a conventional porro prism design, the objective lenses are closer together than the ocular lenses. Like most reverse porro prisms, Pentax Papilios are very compact, being just 4.4 inches long by 4.25 inches wide, and weighing just 10.5 oz. You basically never even notice that these are around your neck, even after extended hours in the field. Papilios are made with BaK-4 glass prisms, aspherical lens elements, and fully multi-coated optics to maximize light transmission and minimize distortion. While they do this with admirable success, the truth is that they are still not a binocular to use in really limited light. This isn’t really a revelation though. Even with the world’s finest glass, 21-mm objective lenses are physically limited in light-gathering power, and even with the most efficient light transmission possible, they won’t be blindingly bright. In most light conditions, the brightness of the Papilios is more than sufficient for its primary intended use. The focus knob is centrally located and less than half an inch wide, but it is raised enough above the prism housing to be easily accessible. It is made of deeply-ridged, hard plastic and turns with great ease, making for extremely precise focus. We soon noticed that the Papilios take fully 3.1 turns of the focus knob to go from minimum close focus to infinity. There is a really good reason for this. To achieve that incredible 18-inch close focus without field collapse, Pentax designed an adjustment for parallax that is, as far as we know, unique. When focusing, the objective lenses move simultaneously on non-parallel tracks. When you focus on something further away, the lenses move toward your eyes and separate from each other; as you focus on closer objects, they move away from your eyes and converge on each other. That they do so with such ease and smoothness is nothing short of remarkable. You’ll have to pardon us, but to optics geeks like us, this is just really cool! With the 6.5x Papilio, the field of view at 1000 yards is a very respectable 393 feet, while the 8.5x model is a bit more restricted at 315 feet. In fact, compared to other mini-binoculars, the Papilios have a relatively large field of view. We measured the interpupilary distance range of the Papilios at 55 - 74 mm. What does that mean to you? The interpupillary distance is how far apart your pupils are. For a binocular to be comfortable, the ocular lenses must be positioned directly over your pupils, and the broader a range offered by a binocular, the greater the probability that you can do this. Mini-binoculars often lack sufficient range to be comfortable for all users but the Pentax Papilios are well designed in this regard. The eye relief claimed by Pentax is a relatively short 15 mm, though this amount of eye relief is common in reverse porro prism binoculars. Here we found something interesting: we used the Papilios with the eyecups fully extended with comfort. We’ve had had trouble with similar designs from other manufacturers that claimed equivalent or longer eye relief. Whatever the cause of this discrepancy, the eye relief of the Papilios was quite adequate. The Papilios show only a little field curvature with a slight tendency for straight lines to bow inward at the outer edges of the visual field. We did note a bit of blurriness at the outer field edges. We saw virtually no color aberration even on brightly-lit, high-contrast objects, which is fairly remarkable. We detected no color bias under any light conditions. On the Papilios, the diopter adjusts with a rotating ring on the right ocular tube. The ring turns with relative ease through a series of closely-spaced click-stops. Thus, while not a locking mechanism, any selected position is stable. A raised line on the ring lines up with a raised dot in the rubber armoring of the ocular tube to indicate the position for equal eyes. 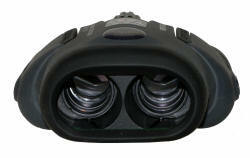 The eyecups adjust with a helical twist mechanism through three positions: fully in, fully out and halfway between. Each position is stabilized against collapse by detents. These are fairly elegant refinements on a binocular of this class. Pentax used an interesting structural design feature: instead of a single central hinge, the Papilios have two “wings” that hold the ocular lenses and attach to the main chassis by separate hinges. Moving either wing causes the other to move the same amount. The body is encased in textured dark green rubber armoring that imparts a secure grip and a nice feel. The ocular wings have shallow thumb grooves, as does the bridge structure between them. There is a tripod attachment site on the underside of the body. This feature would be useful if one were studying a particular object or creature for a long period of time or trying to sketch from nature. The thin nylon web strap has plastic attachments that snap into recessed grommets in the surface of the wings. This attachment allows the entire assembly to rotate around the attachment point, for greater user comfort. The strap attachments fit so closely against the body of the binocular that they avoid chafing against the hands, a frequent problem for other mini-binoculars. The rainguard is a hard plastic pair of cups held together by a bridging section. The fit over the soft rubber of the eyecups is tight enough that they do not dislodge easily so the rainguard won’t get knocked off inadvertently. There are no lens caps for the recessed objective lenses. Also included is a padded black case, which is large enough to hold the binocular with the eyecups extended so they don’t have to be folded down before being put away. The binocular strap fits out the sides of the Velcro-closing flap so that binocular and case can be worn over the neck or shoulder. The case also features a belt-mounting loop on the back for convenient deployment at the waist. This helps because, without a strap for the case itself, you would have to hold the case if you carried it into the field. All the great design and remarkable engineering of the Papilios comes at a surprisingly low price: the 6.5x model sells for just $119.00, while the 8.5x model is only $139.00. Though the Papilios were optimized primarily as butterflying binoculars, their versatility makes them ideal for a wide variety of other activities. They are easily tucked into a glove compartment so you can have them everywhere you go. Their smooth operation and light weight makes them easy for young children to use. Their ability to function like a hand-lens gives them an extra dimension in the field. For up-close study of butterflies, birds, bugs, blooms or whatever, Pentax Papilio binoculars are hard to surpass.